A couple of months ago I did an interview with one of the foremost scholars of rabbinical Judaism, Michael Hoffman. The occasion was the release of his latest book The Occult Renaissance Church of Rome. At the time I did not expect to have to ask for a follow-up interview with him, but when I learned that Amazon had censored his books (please see Hoffman’s own account of this here). Specifically, the ban is on three of his books. 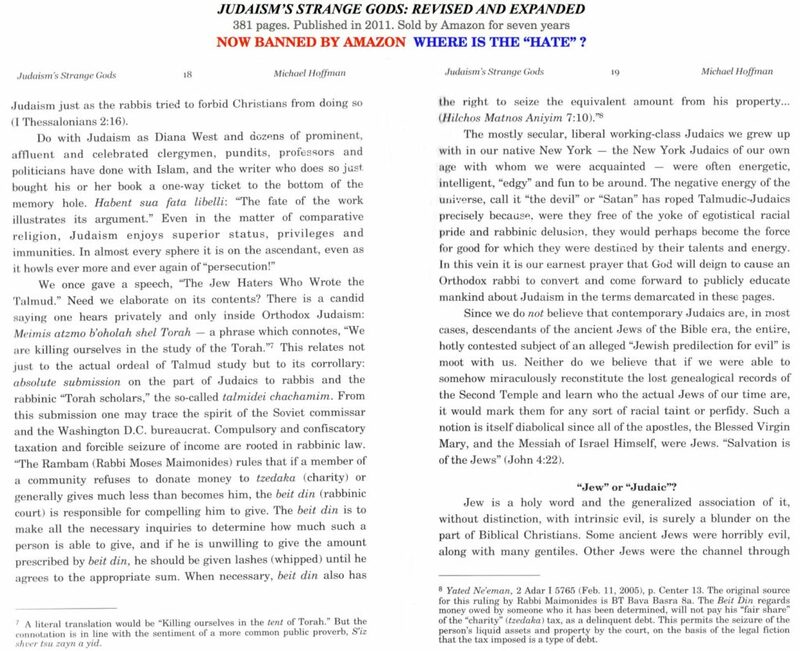 A complete ban (Kindle + printed book) on Judaism’s Strange Gods: Revised and Expanded, as well as The Great Holocaust Trial: Revised and Expanded, while his textbook, Judaism Discovered, has been removed from the Kindle. I felt that I had to talk to him again and he kindly agreed to reply to my questions. I submit to you the full text of our Q&A which I will follow-up with a short commentary. Hoffman: Whether it is Facebook, Google or Amazon, the excuse most often cited for suppression is “content guidelines’ violation.” Amazon notified us on August 13 that two of our titles, which they have been selling for years and in thousands of copies, Judaism Discovered, our 1100 page textbook published in 2008, and Judaism’s Strange Gods: Revised and Expanded, published in 2010 — were being permanently removed after “review” by the Kindle Direct Publishing (KDP) unit of Amazon. A facsimile of the KDP notice can be viewed here. The Saker: What do you believe could be done to resist this state of affairs? what can we all do to put a stop to this kind of censorship? Personally, I find the latter much worse. This article was posted on Saturday, September 15th, 2018 at 1:59am and is filed under Censorship, Corporate Globalization, Interview.